“They don’t have a plan” is not a valid criticism. If you think it is, you’re an over-thinker, and I’d like you to meet two people whose success you’re probably baffled by. YOU DON’T NEED A DETAILED PLAN TO SUCCEED. Do you understand that? If you don’t, you may be over-educated, and destined for frustration this fall. Okay, my relaxed morning was ruined today by a phone call with my Story Circles co-producer Jayde Lovell in which she got me angry, starting with remembering my Jack Black Ocean Symphony PSA, then remembering the Occupy Wall Street movement, then connecting the dots to the present Presidential campaign. It starts with the overly-analytical, largely humorless people who manage to bore everyone so painfully that after a while nobody wants to listen to them moan about the demise of nature. In 2003 I tried to explain to them how this works — that mass communication needs to begin with a voice that people want to listen to. In that spirit I wrote and directed “The Ocean Symphony,” a Public Service Announcement (PSA) starring Jack Black and 20 comic actors creating a bad symphony for the oceans. It was the pre-Youtube days so we hired a distributor who sent the PSA out to 1,000 TV stations. They then used Nielsen tracking to record the airing of it for the next 18 months. It was aired by over 350 stations for free (as a public service). We got lucky (something that does actually happen to people when they try things). The same week they sent out the PSA was also the week that Jack Black’s movie “School for Rock” debuted at #1 at the box office so there was lots of awareness of him. The distributor sent us big fat monthly reports which multiplied the airings by the individual costs of air time in each market had we paid for it. By the end of the 18 months the reports showed that the PSA scored over $10 million in free air time. It also played on the giant SONY video screen in Times Square, once an hour for two months. Guess what all that success resulted in for my next ideas for humorous PSAs. Bupkis. Nothing but a bunch of overly-analytical conservation people who launch stillborn campaigns yet think every piece of media attention MUST have a detailed action plan attached to it to have any value. Such people are the masterminds of endless failed campaigns. This was much of the message of my first book, Don’t Be Such a Scientist; Talking Substances in an Age of Style. Yes, it is important to have at least some plan, but the idea of picking apart a good front end product because the back end is not yet completely nailed down is a recipe for cautious, uninspired failure. As I explained in that book, the principle is AROUSE and FULFILL. If you don’t arouse, there will be no fulfillment. And more importantly, yes, it is possible to arouse without a detailed plan to fulfill. It happens all the time. But it will never happen if you are one of the brainiacs who prides themselves on critiquing projects before they can get off the ground because you think there’s not a good enough action plan. I listened for a bit, and then I ruined the whole evening by taking on the entire table, trying to explain to them and all of their over-educated sensibilities that lots of mass movements erupt with little more than passion which can eventually be harnessed and turned into action. They thought I was stupid. I thought they were stupid. And even the next week I heard my media hero Chris Matthews echo the same sentiment on his MSNBC show “Hardball.” He said the same thing — that he didn’t get it with the Occupy Wall Street movement — they have no plan — how are they going to stop rich people from getting rich — they are clueless. And by the way, imagine if the action plan in September, 2011 had included, “We plan in 2016 to have Vermont Senator Bernie Sanders run for President espousing our basic principles.” How much ridicule do you think that would have drawn. This has become a trademark of the overly analytical, overly planning, overly controlling, overly educated types who may very well get their asses handed to them this fall by Donald Trump as they laugh at his lack of specifics in his political agenda so far. You can find their type running wild all over the Huffington Post and tons of political blogs that have been 100% wrong on Trump for almost a year now. They are smug, self-assured, and absolutely certain that if you don’t know EXACTLY what your plan is, there is zero chance you will ever succeed. Guess what the Occupy Wall Street movement produced … Bernie Sanders. Plus a single word narrative — “Occupy” — one word that speaks their entire philosophy. His political agenda is not much more specific than “eat the rich.” It’s easy to pick what he has to say apart with “how’s he going to pay for it all?” Same for Trump and his stupid wall, and stupid muslim ban, and stupid nuclear plans, and stupid stupidity. But guess who has all the energy and momentum. Everyone is trying to blame the popularity of these two candidates on the anger and frustration voters feel towards “the establishment.” At the core of much of that rage is the frustration of listening to the know-it-alls who think they can see what doesn’t work. And in fact that has been the overall pattern for the past year — the know-it-alls saying over and over again there’s no way Trump and Bernie can succeed — the numbers are against them. 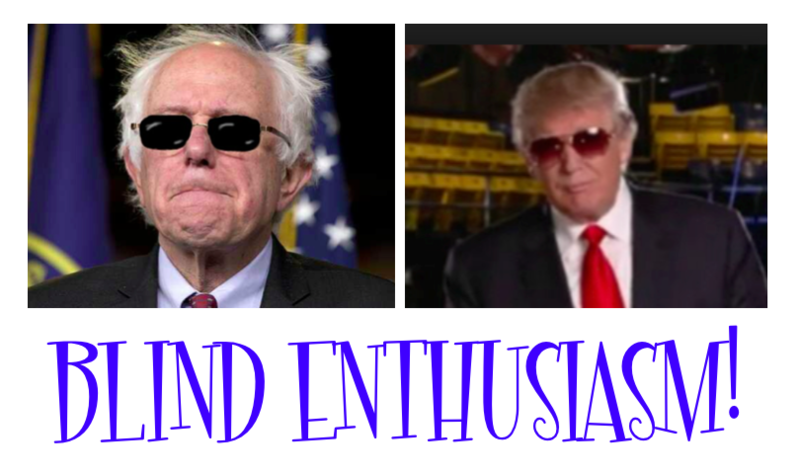 Well, Trump has now officially kicked their asses and Bernie is still in the fight. This election is about more than just anger. It’s a referendum on the know-it-all negators who spend their lives squelching people’s plans because they aren’t “thought out” enough. People are tired of being told their ideas can’t work. A lot of people are ready to either make America great again or eat the rich. They don’t quite know how, but they really don’t care. Their enthusiasm is blind, and sometimes that’s all that’s needed.